Kalākaua was born at 2:00 a.m. on November 16, 1836, to Caesar Kaluaiku Kapaʻakea and Analea Keohokālole in the grass hut compound belonging to his maternal grandfather ʻAikanaka, at the base of Punchbowl Crater in Honolulu on the island of Oʻahu. Of the aliʻi class of Hawaiian nobility, his family were considered collateral relations of the reigning House of Kamehameha, sharing common descent from the 18th-century aliʻi nui Keaweʻīkekahialiʻiokamoku. From his biological parents, he descended from Keaweaheulu and Kameʻeiamoku, two of the five royal counselors of Kamehameha I during his conquest of the Kingdom of Hawaiʻi. Kameʻeiamoku, the grandfather of both his mother and father, was one of the royal twins alongside Kamanawa depicted on the Hawaiian coat of arms. However, Kalākaua and his siblings traced their high rank from their mother's line of descent, referring to themselves as members the "Keawe-a-Heulu line", although later historians would refer to the family as the House of Kalākaua. The second surviving child of a large family, his biological siblings included his elder brother James Kaliokalani, and younger siblings Lydia Kamakaʻeha (later renamed Liliʻuokalani), Anna Kaʻiulani, Kaʻiminaʻauao, Miriam Likelike and William Pitt Leleiohoku II. Given the name Kalākaua, which translates into "The Day [of] Battle", the date of his birth coincided with the signing of the unequal treaty imposed by British Captain Lord Edward Russell of the Actaeon on Kamehameha III. He and his siblings were hānai (informally adopted) to other family members in the Native Hawaiian tradition. Prior to birth, his parents had promised to give their child in hānai to Kuini Liliha, a high-ranking chiefess and the widow of High Chief Boki. However, after he was born, High Chiefess Haʻaheo Kaniu took the baby to Honuakaha, the residence of the king. Kuhina Nui (regent) Elizabeth Kīnaʻu, who disliked Liliha, deliberated and decreed his parents to give him to Haʻaheo and her husband Keaweamahi Kinimaka. When Haʻaheo died in 1843 she bequeathed all her properties to him. After Haʻaheo's death, his guardianship was entrusted in his hānai father, who was a chief of lesser rank; he took Kalākaua to live in Lāhainā. Kinimaka would later marry Pai, a subordinate Tahitian chiefess, who treated Kalākaua as her own until the birth of her own son. At the age of four, Kalākaua returned to Oʻahu to begin his education at the Chiefs' Children's School (later renamed the Royal School). He and his classmates had been formally proclaimed by Kamehameha III as eligible for the throne of the Kingdom of Hawaii. 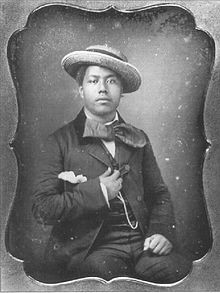 His classmates included his siblings James Kaliokalani and Lydia Kamakaʻeha and their thirteen royal cousins including the future kings Kamehameha IV, Kamehameha V and Lunalilo. They were taught by American missionaries Amos Starr Cooke and his wife, Juliette Montague Cooke. At the school, Kalākaua became fluent in English and the Hawaiian language and was noted for his fun and humor rather than his academic prowess. The strong-willed boy defended his less robust elder brother Kaliokalani from the older boys at the school. In October 1840, their paternal grandfather Kamanawa II requested his grandsons to visit him on the night before his execution for the murder of his wife Kamokuiki. The next morning the Cookes allowed the guardian of the royal children John Papa ʻĪʻī to bring Kaliokalani and Kalākaua to see Kamanawa for the last time. It is not know if their sister was also taken to see him. Later sources, especially in biographies of Kalākaua indicated that the boys witnessed the public hanging of their grandfather at the gallows. Historian Helena G. Allen noted the indifference the Cookes' had toward the request and the traumatic experience it must have been for the boys. After the Cookes retired and closed the school in 1850, he briefly studied at Joseph Watt's English school for native children at Kawaiahaʻo and later joined the relocated day school (also called Royal School) run by Reverend Edward G. Beckwith. Illness prevented him from finishing his schooling and he was sent back to Lāhainā to live with his mother. Following his formal schooling, he studied law under Charles Coffin Harris in 1853. Kalākaua would appoint Harris as Chief Justice of the Supreme Court of Hawaii in 1877. Kalākaua was briefly engaged to marry Princess Victoria Kamāmalu, the younger sister of Kamehameha IV and Kamehameha V. However, the match was terminated when the princess decided to renew her on-and-off betrothal to her cousin Lunalilo. Kalākaua would later fall in love with Kapiʻolani, the young widow of Bennett Nāmākēhā, the uncle of Kamehameha IV's wife Queen Emma. 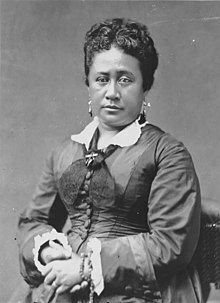 A descendant of King Kaumualiʻi of Kauai, Kapiʻolani was Queen Emma's lady-in-waiting and Prince Albert Edward Kamehameha's nurse and caretaker. They married on December 8, 1863, in a quiet ceremony conducted by a minister of the Anglican Church of Hawaiʻi. The timing of the wedding was heavily criticized since it fell during the official mourning period for King Kamehameha IV. The marriage remained childless. ^ a b c d e f g h i j k l m n o p Genealogy of Liliuokalani, page 400, appendix B, No. 2 Queen of Hawaii, Liliuokalani. "Hawaii's Story by Hawaii's Queen". University of Hawaii Press. Retrieved September 29, 2016. ^ Forbes 2003, p. 404. ^ a b "Crowned! Kalakaua's Coronation Accomplished: A Large But Unenthusiatic Assemblage!". The Hawaiian Gazette. Honolulu, Hawaiian Islands. February 14, 1883. LCCN sn83025121. Archived from the original on December 29, 2017. Retrieved January 17, 2017 – via Chronicling America: Historic American Newspapers. Lib. of Congress. ^ a b c d Biographical Sketch 1884, pp. 72–74. ^ a b c Allen 1995, pp. 1–6. ^ Supreme Court of Hawaii (1866). In The Matter Of The Estate Of L. H. Kaniu, Deceased. Reports of a Portion of the Decisions Rendered by the Supreme Court of the Hawaiian Islands in Law, Equity, Admiralty, and Probate: 1857–1865. Honolulu: Government Press. pp. 82–86. OCLC 29559942. ^ Dibble 1843, p. 330. ^ a b c d e f g h i Zambucka 2002, pp. 5–10. ^ Cooke & Cooke 1937, pp. 84–85. ^ Gutmanis 1974, p. 144. ^ a b Allen 1995, p. 8. ^ Haley 2014, p. 100. ^ Allen 1995, pp. 23–24. ^ "Chief Justice Allen resigns, Harris appointed to take his place". The Pacific Commercial Advertiser at Newspapers.com. February 3, 1877. OCLC 8807872. Archived from the original on August 23, 2018. Retrieved August 21, 2018. ^ a b Allen 1982, p. 22. ^ a b c Damon, Samuel C. (February 1, 1876). "The Kings of Hawaii". The Friend. 25 (2). Honolulu: Samuel C. Damon. pp. 9–12. ^ "By Authority". The Polynesian. Honolulu, Hawaiian Islands. November 5, 1853. LCCN sn82015408. Archived from the original on June 30, 2015. Retrieved January 9, 2017 – via Chronicling America: Historic American Newspapers. Lib. of Congress. ^ Allen 1995, pp. 28–29. ^ a b "H. R. H. Prince L. Kamehameha at Victoria, Vancouver's Island". Polynesian at Newspapers.com. November 3, 1860. p. 2. OCLC 8807758. Archived from the original on August 23, 2018. Retrieved August 22, 2018. ^ Baur 1922, pp. 248–249. ^ Zambucka 2002, p. 8. ^ "Appropriation Bill for 1858–1859". The Pacific Commercial Advertiser. Honolulu, Hawaiian Islands. May 12, 1859. LCCN sn82015418. Archived from the original on May 28, 2017. Retrieved January 9, 2017 – via Chronicling America: Historic American Newspapers. Lib. of Congress. ^ "Postmaster General – office record" (PDF). state archives digital collections. state of Hawaii. Archived (PDF) from the original on August 4, 2018. Retrieved February 3, 2017. ^ "Chamberlain – office record" (PDF). state archives digital collections. state of Hawaii. Archived (PDF) from the original on February 9, 2017. Retrieved February 3, 2017. ^ Twain 1938, p. 105. ^ Allen 1995, pp. 33–34. ^ Liliuokalani 1898, pp. 12–15. ^ Zambucka 2002, p. 15. ^ Rossi 2013, pp. 103–107. ^ a b "The Heir Apparent". The Pacific Commercial Advertiser. XXI (42). Honolulu. April 14, 1877. p. 2. OCLC 8807872. Archived from the original on November 8, 2017. Retrieved January 27, 2017 – via Chronicling America: Historic American Newspapers. Lib. of Congress. ^ Tsai 2014, pp. 115–143. ^ "King Kalakaua". Evening Star. Washington D. C. December 12, 1874. LCCN sn83045462. Archived from the original on January 16, 2018. Retrieved January 12, 2017 – via Chronicling America: Historic American Newspapers. Lib. of Congress. ; Monkman, Betty C. "The White House State Dinner". The White House Historical Association. Archived from the original on December 21, 2016. Retrieved January 12, 2017. ^ Kuykendall 1967, pp. 396–397; "The New Hawaiian Treaty". The Pacific Commercial Advertiser. Honolulu, Hawaiian Islands. May 15, 1886. LCCN sn85047084. Archived from the original on February 2, 2017. Retrieved January 26, 2017 – via Chronicling America: Historic American Newspapers. Lib. of Congress. ^ "Hawaiian Legislature: Department of Foreign Affairs". The Pacific Commercial Advertiser. Honolulu, Hawaiian Islands. June 10, 1882. LCCN sn82015418. Archived from the original on February 2, 2017. Retrieved January 24, 2017 – via Chronicling America: Historic American Newspapers. Lib. of Congress. ; "The Legislature". The Daily Bulletin. Honolulu, Hawaiian Islands. July 1, 1884. LCCN sn82016412. Archived from the original on February 2, 2017. Retrieved January 24, 2017 – via Chronicling America: Historic American Newspapers. Lib. of Congress. ; "Resolutions". The Pacific Commercial Advertiser. Honolulu, Hawaiian Islands. September 28, 1886. LCCN sn85047084. Archived from the original on February 2, 2017. Retrieved January 24, 2017 – via Chronicling America: Historic American Newspapers. Lib. of Congress. ^ "The King's Tour Round the World: Portugal, Spain, Scotland, England, Paris. etc". Honolulu, Hawaiian Islands: The Pacific Commercial Advertiser. October 29, 1881. LCCN sn82015418. Archived from the original on January 16, 2018. Retrieved January 14, 2017 – via Chronicling America: Historic American Newspapers. Lib. of Congress. ^ "Proclamation". The Pacific Commercial Advertiser. Honolulu, Hawaiian Islands. February 12, 1881. LCCN sn82015418. Archived from the original on January 16, 2018. Retrieved January 14, 2017 – via Chronicling America: Historic American Newspapers. Lib. of Congress. ^ Kuykendall 1967, pp. 228–230; "The King's Tour Around the World: Last Days in Japan". The Pacific Commercial Advertiser. Honolulu, Hawaiian Islands. June 11, 1881. LCCN sn82015418. Archived from the original on January 16, 2018. Retrieved January 14, 2017 – via Chronicling America: Historic American Newspapers. Lib. of Congress. ^ "The King's Tour Round the World: Additional Particulars of the Royal Visit to Spain and Portugal". The Pacific Commercial Advertiser. Honolulu, Hawaiian Islands. October 15, 1881. LCCN sn82015418. Archived from the original on August 23, 2018. Retrieved January 14, 2017 – via Chronicling America: Historic American Newspapers. Lib. of Congress. ^ "A Royal Visitor". Evening Star. Washington, D. C. September 28, 1881. LCCN sn83045462. Archived from the original on August 23, 2018. Retrieved January 14, 2017 – via Chronicling America: Historic American Newspapers. Lib. of Congress. ^ "Kalakaua Visits Edison: The King in Search of a Means to Light Up Honolulu". The Sun. New York, NY. September 26, 1881. LCCN sn83030272. Archived from the original on October 29, 2016. Retrieved January 14, 2017 – via Chronicling America: Historic American Newspapers. Lib. of Congress. ; "King Kalakaua's Movements – His Majesty Examines The Edison Electric Light" (PDF). The New York Times. New York. September 26, 1881. Retrieved January 14, 2017. ^ Staton, Ron. "Oahu: The Iolani, America's only royal palace". Seattle Times. Retrieved March 3, 2016. ^ a b c "ʻIolani Palace NRHP Asset Details". National Park Service. Archived from the original on January 13, 2017. Retrieved January 10, 2017. ^ "Legislative Jottings". The Pacific Commercial Advertiser. Honolulu, Hawaiian Islands. July 20, 1878. LCCN sn82015418. Archived from the original on April 17, 2018. Retrieved January 17, 2017 – via Chronicling America: Historic American Newspapers. Lib. of Congress. ^ "Asian American and Pacific Islander Heritage: A Discover Our Shared Heritage Travel Itinerary". www.nps.gov. Archived from the original on October 23, 2017. Retrieved August 2, 2018. ^ "(Translation from the Hawaiian) Address by His Excellency John M. Kapena, Minister of Foreign Relations". The Pacific Commercial Advertiser. Honolulu, Hawaiian Islands. January 3, 1880. LCCN sn82015418. Archived from the original on August 2, 2018. Retrieved January 16, 2017 – via Chronicling America: Historic American Newspapers. Lib. of Congress. ^ a b "The New Palace". The Pacific Commercial Advertiser. Honolulu, Hawaiian Islands. January 3, 1880. LCCN sn82015418. Archived from the original on March 25, 2018. Retrieved January 16, 2017 – via Chronicling America: Historic American Newspapers. Lib. of Congress. ^ Kuykendall 1967, p. 262; "Grand Masonic Banquet". The Pacific Commercial Advertiser. Honolulu, Hawaiian Islands. December 30, 1882. LCCN sn82015418. Archived from the original on August 23, 2018. Retrieved December 27, 2016 – via Chronicling America: Historic American Newspapers. Lib. of Congress. ^ "Electric Light at Palace Square". Honolulu Advertiser at Newspapers.com. July 22, 1886. Retrieved August 24, 2018. ^ Kuykendall 1967, p. 97. ^ "An Act". The Hawaiian Gazette. Honolulu, Hawaiian Islands. August 4, 1880. LCCN sn83025121. Archived from the original on August 23, 2018. Retrieved January 17, 2017 – via Chronicling America: Historic American Newspapers. Lib. of Congress. ^ a b "Postponed Pleasures". The Hawaiian Gazette. Honolulu, Hawaiian Islands. February 21, 1883. LCCN sn83025121. Archived from the original on August 23, 2018. Retrieved January 18, 2017 – via Chronicling America: Historic American Newspapers. Lib. of Congress. ^ "The Legislature". The Pacific Commercial Advertiser. Honolulu, Hawaiian Islands. September 22, 1886. LCCN sn85047084. Archived from the original on August 23, 2018. Retrieved January 18, 2017 – via Chronicling America: Historic American Newspapers. Lib. of Congress. ^ "Local News". The Daily Herald. Honolulu, Hawaiian Islands. November 3, 1886. LCCN sn85047239. Archived from the original on August 23, 2018. Retrieved January 18, 2017 – via Chronicling America: Historic American Newspapers. Lib. of Congress. ^ "His Majesty's Jubilee Birthday". The Daily Bulletin. Honolulu, Hawaiian Islands. November 17, 1886. LCCN sn82016412. Archived from the original on August 23, 2018. Retrieved January 18, 2017 – via Chronicling America: Historic American Newspapers. Lib. of Congress. ^ Kuykendall 1967, p. 13; "General Order No. 1". The Pacific Commercial Advertiser. Honolulu. February 28, 1874. p. 1. LCCN sn82015418. Archived from the original on February 4, 2015. Retrieved February 10, 2017. ^ a b Newbury 2001, p. 22; Kuykendall 1967, pp. 350–352; "Army Commissions office record" (PDF). state archives digital collections. state of Hawaii. Archived (PDF) from the original on February 9, 2017. Retrieved February 3, 2017. ^ a b Chapter XXII: Act Act To Organize The Military Forces Of The Kingdom. Laws of His Majesty Kalakaua, King of the Hawaiian Islands: Passed by the Legislative Assembly at Its Session of 1886. Honolulu: Black & Auld. 1886. pp. 37–41. OCLC 42350849. ^ "Navy, Royal Hawaiian – Commissions office record" (PDF). state archives digital collections. state of Hawaii. Archived (PDF) from the original on February 9, 2017. Retrieved February 3, 2017. ^ Kuykendall 1967, pp. 403–404. ^ Kuykendall 1967, pp. 410–411, 421, 465–466. ^ Chapter XXV: An Act Relating To The Military Forces Of The Kingdom. Laws of His Majesty Kalakaua, King of the Hawaiian Islands: Passed by the Legislative Assembly at Its Session of 1888. Honolulu: Black & Auld. 1888. pp. 55–60. OCLC 42350849. ^ Chapter LII: An Act To Provide For A Military Force To Be Designated As 'The King's Royal Guard'. Laws of His Majesty Kalakaua, King of the Hawaiian Islands: Passed by the Legislative Assembly at Its Session of 1890. Honolulu: Black & Auld. 1890. pp. 107–109. OCLC 42350849. ^ "Hawaiian Primacy in Polynesia". The Pacific Commercial Advertiser. Honolulu, Hawaiian Islands. November 19, 1881. LCCN sn82015418. Archived from the original on August 23, 2018. Retrieved January 13, 2017 – via Chronicling America: Historic American Newspapers. Lib. of Congress. ^ "The "Bulletin's" Protest". The Daily Bulletin. Honolulu, Hawaiian Islands. September 7, 1883. LCCN sn82016412. Archived from the original on August 23, 2018. Retrieved January 13, 2017 – via Chronicling America: Historic American Newspapers. Lib. of Congress. ^ Kuykendall 1967, pp. 324–329; "Polynesian Dominion Proclamation". The Pacific Commercial Advertiser. Honolulu, Hawaiian Islands. March 30, 1887. OCLC 8807872. Archived from the original on May 23, 2018. Retrieved January 13, 2017 – via Chronicling America: Historic American Newspapers. Lib. of Congress. ^ Alexander 1896, p. 19. ^ Alexander 1894, p. 27. ^ Haley 2014, p. 265. ^ Zambucka 2002, p. 83. ^ Daws 1968, p. 245. ^ Dye 1997, p. 209. ^ a b Krout 1898, p. 7. ^ Forbes 2003, p. 290. ^ "Mass Meeting". The Daily Bulletin. Honolulu, Hawaiian Islands. June 30, 1887. LCCN sn82016412. Archived from the original on February 2, 2017. Retrieved August 22, 2018 – via Chronicling America: Historic American Newspapers. Lib. of Congress. ^ MacLennan 2014, pp. 47–48. ^ Rego, Nilda (April 25, 2013). "Days Gone By: 1890: Hawaii's King Kalakaua visits San Francisco". The Mercury News. San Francisco. OCLC 723850972. Archived from the original on November 4, 2016. Retrieved November 3, 2016. ^ Dando-Collins 2014, p. 42; Mcdermott, Choy & Guerrero 2015, p. 59; Carl Nolte (August 22, 2009). "S.F. 's (New) Palace Hotel Celebrates a Century". San Francisco Chronicle. OCLC 66652554. Archived from the original on September 27, 2009. Retrieved April 18, 2010. ^ Thompson, David (February 2013). "Kalakaua's Famous Last Words?". Honolulu Magazine. OCLC 180851733. Archived from the original on June 7, 2013. Retrieved May 22, 2013. ^ "Bishop Museum Tries To Revive Past King's Voice". Kitv.com. November 24, 2009. OCLC 849807032. Archived from the original on March 8, 2012. Retrieved November 20, 2016. ^ Kam 2017, pp. 127–130. ^ Parker 2008, p. 33. ^ Parker 2008, pp. 15, 39. ^ "The Weird Ceremonial of Monarchial Times Marked Transfer of Kalakaua Dynasty Dead to Tomb". The Hawaiian Gazette. Honolulu. June 28, 1910. p. 2. LCCN sn83025121. Archived from the original on October 18, 2014. Retrieved June 25, 2013. ^ Zambucka 2002, pp. 63–65; Vowell 2011, p. 84; Kanahele, George (July 1979). "Hawaiian Renaissance Grips, Changes Island History". Haʻilono Mele. 5 (7). Honolulu: The Hawaiian Music Foundation. pp. 1–9. LCCN no99033299. Archived from the original on August 23, 2018. Retrieved December 27, 2016. ^ a b Williams, Ronald, Jr. (January 2015). "The Other Hawaiian Renaissance". Hana Hou!. 17 (6). Honolulu. OCLC 262477335. Archived from the original on February 2, 2017. Retrieved December 27, 2016. ^ a b "Patron of Hawaiian Music Culture: David Kalakaua (1836–1891)". Hawaiian Music Hall of Fame. Archived from the original on February 29, 2012. Retrieved February 24, 2008. ^ "Merrie Monarch Festival". eVols. University of Hawai'i at Manoa. hdl:10524/1440. Archived from the original on August 23, 2018. Retrieved January 28, 2017. ^ "An Act: To Regulate the Hawaiian Board of Health". The Pacific Commercial Advertiser. Honolulu, Hawaiian Islands. October 11, 1886. LCCN sn85047084. Archived from the original on February 2, 2017. Retrieved January 27, 2017 – via Chronicling America: Historic American Newspapers. Lib. of Congress. ^ Risser, William. "Hawai'i treasures on display". Honolulu Advertiser. OCLC 8807414. Archived from the original on February 2, 2017. Retrieved January 28, 2017. ^ a b Chapin 1984, pp. 67−68. ^ Chapin 2000, p. 70. ^ Chapin 1996, pp. 59–61. ^ Zambucka 2002, pp. 63–64; "Hawaii Ponoi". huapala.org. Archived from the original on January 17, 2018. Retrieved January 23, 2017. ; "The Hawaii State Song". netstate.com. Archived from the original on October 14, 2017. Retrieved January 23, 2017. ^ Zambucka 2002, p. 64; "Sweet Lei Lehua". huapala.org. Archived from the original on October 25, 2016. Retrieved January 15, 2017. ; "ʻAkahi Hoʻi". huapala.org. Archived from the original on November 5, 2016. Retrieved January 29, 2017. ; "E Nihi Ka Hele". huapala.org. Archived from the original on May 18, 2017. Retrieved January 29, 2017. ; "Ka Momi". huapala.org. Archived from the original on October 30, 2016. Retrieved January 29, 2017. ; "Koni Au I Ka Wai". huapala.org. Archived from the original on October 30, 2016. Retrieved January 29, 2017. ^ "David Kalakaua (1836–1891): Inaugural Hall of Fame Inductee, 1997". Ukulele Hall of Fame Museum. Archived from the original on December 23, 2007. Retrieved October 17, 2007. ^ "Kalakaua Avenue". The Pacific Commercial Advertiser. Honolulu, Hawaiian Islands. March 16, 1905. LCCN sn85047084. Archived from the original on February 2, 2017. Retrieved January 23, 2017 – via Chronicling America: Historic American Newspapers. Lib. of Congress. ; "The House Sensitive". The Hawaiian Gazette. Honolulu, Hawaiian Islands. March 17, 1905. LCCN sn83025121. Archived from the original on February 2, 2017. Retrieved January 23, 2017 – via Chronicling America: Historic American Newspapers. Lib. of Congress. ^ Gordon Y.K. Pang (December 30, 2003). "Old post office assumes new role". Honolulu Advertiser. OCLC 8807414. Archived from the original on November 15, 2011. Retrieved October 21, 2010. ^ "King David Kalakaua – Honolulu, HI". Waymarking.com. Archived from the original on August 26, 2016. Retrieved February 1, 2017. ; "History of the King Kalakaua Statue Waikiki, Oahu, Hawaii". Hawaii for Visitors. Archived from the original on April 28, 2017. Retrieved February 1, 2017. ^ "Translation for He Mele No Lilo". Kamehameha Schools. Archived from the original on February 15, 2017. Retrieved February 15, 2017. ^ "Ulukau: Na mele aimoku, na mele kupuna, a me na mele ponoi o ka Moi Kalakaua I (Dynastic chants, ancestral chants, and personal chants of King Kalākaua I)". ulukau.org. ^ "The Legends and Myths of Hawaii: The Fables and Folk-lore of a Strange People". Archived from the original on April 29, 2018. Retrieved April 28, 2018. Adler, Jacob (1965). "The Hawaiian Navy Under King Kalakaua". Seventy-Third Annual Report of the Hawaiian Historical Society for the Year 1964. Honolulu: Hawaiian Historical Society. 73: 7–21. hdl:10524/71. Alexander, William De Witt (1894). Kalakaua's Reign: A Sketch of Hawaiian History. Hawaiian gazette Company. ISBN 978-1976371080. OCLC 16331580. Alexander, William De Witt (1896). 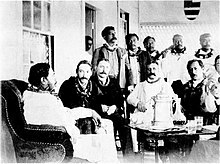 History of Later Years of the Hawaiian Monarchy and the Revolution of 1893. Hawaiian gazette Company. Allen, Helena G. (1982). The Betrayal of Liliuokalani: Last Queen of Hawaii, 1838–1917. Glendale, CA: A. H. Clark Company. ISBN 978-0-87062-144-4. OCLC 9576325. Allen, Helena G. (1995). 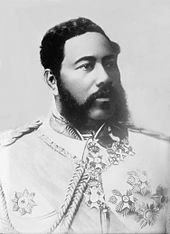 Kalakaua: Renaissance King. Honolulu: Mutual Publishing. ISBN 978-1-56647-059-9. OCLC 35083815. Andrade, Ernest (1977). "Hawaiian Coinage Controversy – Or, What Price a Handsome Profile". The Hawaiian Journal of History. Hawaiian Historical Society. 11. hdl:10524/415. OCLC 60626541 – via eVols at University of Hawai'i at Manoa. Baur, John E. (1922). "When Royalty Came To California". California Historical Society Quarterly. Honolulu: Hawaiian Historical Society. 67: 244–264. Biographical Sketch of His Majesty King Kalakaua. Honolulu Almanac and Directory. Honolulu: P. C. Advertiser Steam Printing Office. 1884. pp. 72–74. OCLC 12787107. Buck, Elizabeth (1994). Paradise Remade: The Politics of Culture and History in Hawai'i. Philadelphia, PA: Temple University Press. ISBN 978-1-4399-0608-8. OCLC 859678638 – via Project MUSE. Chapin, Helen G. (2000). Guide to Newspapers of Hawaiʻi: 1834–2000. Honolulu: Hawaiian Historical Society. hdl:10524/1444. OCLC 45330644. Chapin, Helen G. (1984). "Newspapers of Hawaiʻi's 1834 to 1903: From He Liona to the Pacific Cable". The Hawaiian Journal of History. Honolulu: Hawaiian Historical Society. 18: 47–86. hdl:10524/179. OCLC 60626541 – via eVols at University of Hawai'i at Manoa. Chapin, Helen Geracimos (1996). Shaping History: The Role of Newspapers in Hawaiʻi. Honolulu: University of Hawaii Press. ISBN 978-0-8248-1718-3. OCLC 247186687. Cooke, Amos Starr; Cooke, Juliette Montague (1937). Richards, Mary Atherton (ed.). The Chiefs' Children School: A Record Compiled from the Diary and Letters of Amos Starr Cooke and Juliette Montague Cooke, by Their Granddaughter Mary Atherton Richards. Honolulu: Honolulu Star-Bulletin. OCLC 1972890. Daws, Gavan (1968). Shoal of Time. University of Hawaii Press. ASIN B01FKSJK7U. OCLC 574446745. Dibble, Sheldon (1843). History of the Sandwich Islands. Lahainaluna: Press of the Mission Seminary. OCLC 2145112. Dole, Sanford B. (1936). Farrell, Andrew (ed.). Memoirs of the Hawaiian Revolution. Honolulu: Honolulu, Advertiser Publishing Company. OCLC 4823270 – via HathiTrust. Dye, Bob (1997). Merchant Prince of the Sandalwood Mountains: Afong and the Chinese in Hawai?i. University of Hawaii Press. ISBN 978-0-8248-1772-5. Forbes, David W., ed. (2001). Hawaiian National Bibliography, 1780–1900, Volume 3: 1851–1880. 3. Honolulu: University of Hawaii Press. ISBN 978-0-8248-2503-4. OCLC 123279964. Foster, Jeanette (2014). Volcanoes National Park. Charleston, SC: Arcadia Publishing. ISBN 978-1-4671-3294-7. OCLC 889525130. Gutmanis, June (1974). "Law ... Shall Punish All Men Who Commit Crime". The Hawaiian Journal of History. Honolulu: Hawaiian Historical Society. 8: 143–145. hdl:10524/526. OCLC 60626541. Harper's (January – June 1891). "King Kalakaua of Hawaii". Harper's Weekly. Harper's Magazine Co. 35: 95–96 – via HathiTrust. Hawaii (1918). Lydecker, Robert Colfax (ed.). Roster Legislatures of Hawaii, 1841–1918. Honolulu: Hawaiian Gazette Company. OCLC 60737418. Kalakaua (1971). Greer, Richard A. (ed.). "The Royal Tourist—Kalakaua's Letters Home from Tokio to London". The Hawaiian Journal of History. Honolulu: Hawaiian Historical Society. 5: 75–109. hdl:10524/186. OCLC 60626541 – via eVols at University of Hawai'i at Manoa. Kamins, Robert M.; Adler, Jacob (1984). "Political Debut of Walter Murray Gibson". The Hawaiian Journal of History. Honolulu: Hawaiian Historical Society. 18: 96–115. hdl:10524/609. OCLC 60626541 – via eVols at University of Hawai'i at Manoa. Karpiel, Frank (1999). "Notes & Queries – The Hale Naua Society". The Hawaiian Journal of History. Honolulu: Hawaiian Historical Society. 33: 203–212. hdl:10524/509. OCLC 60626541. Krout, Mary Hannah (1898). Hawaii and a Revolution: The Personal Experiences of a Correspondent in the Sandwich Islands During the Crisis of 1893 and Subsequently. Dodd, Mead. ISBN 978-0364892411. OCLC 179686269. Kam, Ralph Thomas (November 6, 2017). Death Rites and Hawaiian Royalty: Funerary Practices in the Kamehameha and Kalākaua Dynasties, 1819-1953. McFarland. ISBN 978-1-4766-6846-8. Kuykendall, Ralph Simpson (1953). The Hawaiian Kingdom, 1854–1874, Twenty Critical Years. 2. Honolulu: University of Hawaii Press. ISBN 978-0-87022-432-4. Liliuokalani (1898). Hawaii's Story by Hawaii's Queen, Liliuokalani. Boston, MA: Lothrop, Lee and Shepard Co. – via HathiTrust. MacLennan, Carol A. (2014). Sovereign Sugar. Honolulu, HI: University of Hawaii Press. ISBN 978-0-8248-3949-9. OCLC 875895012 – via Project MUSE. Osorio, Jon Kamakawiwoʻole (2002). Dismembering Lāhui: A History of the Hawaiian Nation to 1887. Honolulu: University of Hawaii Press. ISBN 978-0-8248-2549-2. OCLC 48579247. Pogány, András H. (1963). "Joseph Jajczay, Captain of the Hawaiian King's Bodyguard". The Hungarian Quarterly. Budapest: The Hungarian Quarterly. 4 (1–2): 53–61. OCLC 18822542. Quigg, Agnes (1988). "Kalakaua's Hawaiian Studies Abroad Program". The Hawaiian Journal of History. Honolulu: Hawaiian Historical Society. 22: 170–208. hdl:10524/103. OCLC 60626541 – via eVols at University of Hawai'i at Manoa. Rossi, Pualiʻiliʻimaikalani (December 2013). "No Ka Pono ʻOle O Ka Lehulehu: The 1874 Election of Hawaiʻi's Moʻi And The Kanaka Maoli Response" (PDF). Honolulu: University of Hawaii at Manoa. hdl:10125/100744. Silva, Noenoe K. (2004). Aloha Betrayed: Native Hawaiian Resistance to American Colonialism. Durham: Duke University Press. ISBN 978-0-8223-8622-3. OCLC 191222123. Thrum, Thomas G., ed. (1881). Portuguese Immigration to the Hawaiian Islands. Hawaiian Almanac and Annual for 1881. Honolulu: Honolulu Star-Bulletin. hdl:10524/23168. Thrum, Thomas G., ed. (1883). Portuguese Immigration to the Hawaiian Islands. Hawaiian Almanac and Annual for 1883. Honolulu: Honolulu Star-Bulletin. hdl:10524/657. Thrum, Thomas G., ed. (1896). Japanese immigration. Hawaiian Almanac and Annual for 1896. Honolulu: Honolulu Star-Bulletin. hdl:10524/23173. Thurston, Lorrin A. (1936). Memoirs of the Hawaiian Revolution. Honolulu Advertiser Publishing. Tsai, Tiffany Lani Ing (2014). ""He Ka Waiho Hoʻohemahema": Kana Maoli Responses to King Kalakaua's Tour of the Kingdom from 1874 Newspapers in Hawaiʻi". Hawaiian Journal of History. Honolulu: Hawaiian Historical Society. 48: 115–143. hdl:10524/47258. OCLC 60626541. Twain, Mark (1938). Letters from the Sandwich Islands: Written for the Sacramento Union. Palo Alto: Stanford University Press. pp. 16–137. OCLC 187974. Van Dyke, Jon M. (2008). Who Owns the Crown Lands of Hawai`i?. Honolulu, HI: University of Hawaii Press. ISBN 978-0-8248-3210-0 – via Project MUSE. Vowell, Sarah (2011). Unfamiliar Fishes. Riverhead Books. ISBN 978-1-101-48645-0. OCLC 646111859. Wharton, Glenn (2012). The Painted King. Honolulu, HI: University of Hawaii Press. ISBN 978-0-8248-3495-1. OCLC 741751139 – via Project MUSE. Zambucka, Kristin (2002). 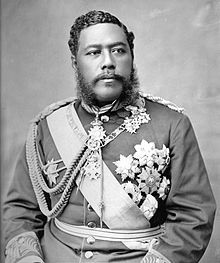 Kalakaua: Hawaiʻi's Last King. Honolulu: Māna Publishing Company. ISBN 978-0-931897-04-7. OCLC 123305738. Armstrong, William N. (1904). Around the World with a King. New York, NY: F. A. Stokes Company – via HathiTrust. Burns, Eugene (1952). The Last King of Paradise. New York: Pellegrini & Cudahy. OCLC 414982. Dukas, Neil Bernard (2004). A Military History of Sovereign Hawaiʻi. Honolulu: Mutual Publishing Company. ISBN 978-1-56647-636-2. OCLC 56195693. Girod, André (2014). American Gothic: Une mosaïque de personnalités américaines (in French). L'Harmattan. ISBN 978-2-343-04037-0. Hallock, Leavitt Homan (1911). Hawaii Under King Kalakaua from Personal Experiences of Leavitt H. Hallock. Portland, ME: Smith & Sale. OCLC 2802182 – via HathiTrust. Houston, James D. (2008). Bird of Another Heaven. New York: Knopf Doubleday Publishing Group. ISBN 978-0-307-38808-7. OCLC 71552454. Ing, Tiffany (May 2015). Illuminating the American, International, and Hawaiʻi Representations of David Kalākaua and His Reign, 1874–1891. University of Hawaii at Manoa. hdl:10125/50983. Kalakaua dead. The king dies on a foreign shore ... at San Francisco, Cal., January 20, 1891. Funeral ceremonies ... Reception in Honolulu ... Notes on the king's trip through southern California, by Lieut. Gen. P. Blow, U.S.N. Reports of Rear Admiral Brown, U.S.N., and Medical Inspector Woods. Honolulu: Bulletin Publishing Company. 1891. OCLC 82800064. Archived from the original on February 2, 2017. Retrieved January 29, 2017 – via HathiTrust. Kalakaua, David; Daggett, Rollin M. (1888). The Legends and Myths of Hawaii: The Fables and Folk-lore of a Strange People. New York, NY: Charles L. Webster & Company – via HathiTrust. Lowe, Ruby Hasegawa (1999). David Kalākaua. Honolulu: Kamehameha Schools Press. ISBN 978-0-87336-041-8. OCLC 40729128. The Pacific Commercial Advertiser (1883). Coronation of the King and Queen of the Hawaiian Islands, at Honolulu, Monday, Feb 12th 1883. Honolulu: Printed at the Advertiser Steam Printing House. OCLC 77955761 – via HathiTrust. Poepoe, Joseph M.; Brown, George (1891). Ka Moolelo o ka Moi Kalakaua I. Honolulu. OCLC 16331688. Rossi, Puali'ili'imaikalani (December 2013). No Ka Pono ʻOle O Ka Lehulehu : The 1874 Election of Hawaiʻi's Moʻi And The Kanaka Maoli Response. University of Hawaii at Manoa. p. 193. Schweizer, Niklaus R. (1991). "King Kalakaua: An International Perspective". The Hawaiian Journal of History. Honolulu: Hawaiian Historical Society. 25: 103–120. hdl:10524/539. OCLC 60626541. Tabrah, Ruth M. (1984). Hawaii: A History. W. W. Norton & Company. ISBN 978-0-393-30220-2. Wikimedia Commons has media related to Kalākaua. Palmer, Walter B.; Day, Clive; Viner, Jacob; Hornbeck, Stanley Kuhl (1919). Reciprocity and commercial treaties. Govt. Print. Off. p. 25 – via HathiTrust. This page was last edited on 8 April 2019, at 06:43 (UTC).